In our quest to play classical guitar as beautifully as possible, we encounter all sorts of tricks, tendencies, classical guitar phrasing rules, and best practices. If we can learn to recognize them, and take advantage of them consistently, amazing things happen. This article explores one such opportunity that you can find in almost every piece of music you play. It’s one of the many brilliant lessons I have learned from my musical coach, Mark Westcott (who explains these things much better than I do). Heads up: This lesson, while not really “advanced”, goes a little deeper than some players may have delved. It assumes you are willing to look closely at how you are playing each note. If this is new to you, congratulations! You have found the way forward. Coming home and greeting our family, friend, neighbor, etc. In music, we also encounter situations that occur frequently. If we can begin to recognize these situations, and find ways to use them to our advantage, everything that we play will sound more structured, more organized, easier to understand, and generally more beautiful. Some things just sound “right”, and if we learn what they are, we are on the right track. The situation I’d like to discuss here is that of pairs of notes. Pairs of notes happen all over the place. There are several examples to come. Before talking about how to handle them, let’s first review our overriding goal which should inform all of our musical decisions. The main goal for our music is to create an emotionally satisfying experience for our listener. Everything else we do is in service to this main goal (or should be). To create an emotional experience that lasts through and is developed by the entire piece of music, we have to create what some call the “long line“. Creating a long line means that we want the action to continue. We want to make choices that keep the action moving. And we want to make choices that minimize the number of stops and restarts. We want to maintain the energy and forward thrust of the piece. Dynamics (louds and softs, swells and fades). Articulations. This is how we actually play each note (short, long, accented, hammer-ons and pull-offs, and many other devices). Our knowledge of which notes lead to which other notes, and our intention to bring them there (like in speech, the point we are making). This is at the heart of classical guitar phrasing. It is very common in music to encounter two short notes leading to a longer note. This could be 2 eighth notes leading to a quarter or half note. It could also be to quarter notes leading to a longer note. It could be 2 half notes leading to a whole note. The important thing to notice and learn to recognize is the pair of notes that lead to longer notes. Ideally, all notes go forward, leading ahead to the next musical idea. In practice, we need to be a bit more specific than that. The way to learn what goes where is to learn to recognize tendencies (such as the note pairs we are talking about here). With time, you can learn to recognize these classical guitar phrasing patterns everywhere and take advantage of the opportunities they hold. So how do we actually demonstrate the role of each note? How do we communicate what leads where? What follows are three different classical guitar phrasing “rules” to make this happen. Not all will work 100% of the time, but mastering all three together is a great place to start, and will make a huge difference in your overall sound. While it seems like a rhythm is a rhythm is a rhythm, it’s actually not so straightforward as that. We are actually able to play notes on the “front”, of the beat, the “back” of the beat, or directly on the beat. 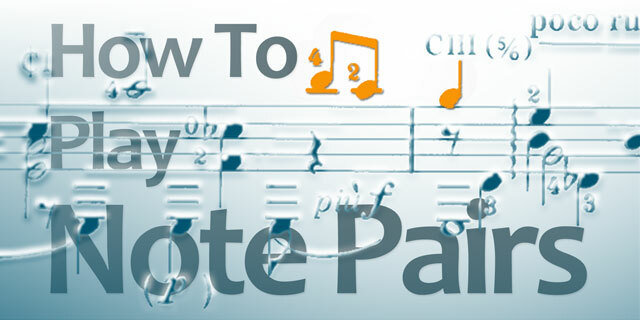 Where we specifically place each note within the rhythm is called “placement”. 1.) The first note is played directly on the beat, and perfectly in time. 2.) The second note is played on the “backside” of the beat, as late as the law allows. This means playing the second note as late as possible without changing the rhythm (or, in other words, the note value). We can also use the volume of each note to demonstrate our intentions about the role of the note. 1.) The first note is played very quietly. 2.) The second note is accented, or played more loudly. Note: you cannot always do it this way, but 99% of the time it works extremely well. While not all music allows for this one, separating the two notes with a small rest is incredibly effective at demonstrating the forward motion of our musical intentions. In short, just stop the sound of the first before the second plays, setting the two notes apart. The main point is just to stop the first note before playing the second note. It doesn’t have to be so precise as all this. It is important not to play the first note staccato. Instead, play the full length of a shorter note, then a rest. If you are playing at faster speeds (tempos), or with smaller note values (like 16th notes) it may end up staccato, and in that case it’s okay. When possible all three of the methods above used together is the most powerful demonstration of what we are shooting for. This isn’t always possible, because we have to balance other considerations in the context of the specific instance. But certainly practice all three together, and use it as much as you can. If you don’t know where it doesn’t work, error on the side of over-using this technique. You will be “right” far more than you will be “wrong”. -If the third note is higher than the second note, play it quieter. -If the third note is lower than the second note, play it louder. There will be times when the opposite may be a better choice, but 90% of the time, this way will work best. Let’s put on our safari hats and take a look at some note pairs in their natural habitats. Perhaps most common, we frequently see 2 eighths leading to a quarter note in music. By making the second eighth louder than both the first and third notes of the measure, this song sound sounds light on it’s feet and spritely. The 2-eighth notes pattern can happen anywhere in the bar. With pick up notes, we handle the two notes as we would anywhere else. To begin a piece, Play the first note as “its own man”. I often think the words “one for nothing” when playing the first note. For the second note, you can use the three techniques above as well as using the word “and” to lead the note forward toward the downbeat of the first measure. This should have you off and running. The same general rules apply to the bass as they do to the melody line. While this example and the next are not precisely what we are talking about here, the same rules work well. When we encounter doubled notes, we can think of them as note pairs as well. The roles stay the same as they do in isolated note pairs. Also note that there are dynamics (the mf and the “ramps”) written under this one. The crescendos and decrescendos (swells and fades) can still happen. You can treat your note pairs as we are talking about here within the larger structure of the written dynamics. Similar to above, repeated half notes in a bassline may be handled in the exact same way. The first half note is the downbeat, which is played directly in time (on the beat). The second half note is the “upbeat”, and can be accented (much of the time) and placed slightly late (as late as the law allows, anyway). My challenge to you: choose any piece of music, and identify all the note pairs within it. Then choose at least one or two places to try this out. As you grow in your classical guitar phrasing abilities and continue to move forward in your practice, seek to always take advantage of the opportunity to play note pairs expressively in this way.